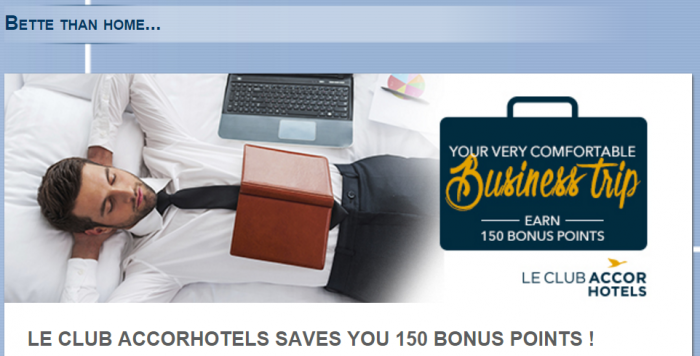 Le Club AccorHotels has launched “Business Package” rate for stays at Mercure, Novotel and Suite Novotel hotels in France that comes with 150 bonus points per stay. The offer is valid for stays that are booked using this “Business Package” rate and consumed by December 31, 2016. Note that the terms state that you could only earn the bonus points once, although I don’t believe that this is the case. The rate that comes up on Accor’s website clearly states that it includes 150 bonus points in addition to breakfast (wifi is free for all anyway). Nobody should really book this rate unless they would pay for the breakfast. The value of 150 points is not a lot. 1. General Le Club AccorHotels terms and conditions apply to the “Better than home” offer. 2. This offer is valid for a stay between 01/01/2016 and 31/12/2016 in one of the participating hotels in France, and booked between 20/12/2015 and 31/12/2016. 3. The stay must be booked at the “Professional rate – Breakfast and wifi included” rate. If this rate is not available, the member cannot benefit from the offer. 4. This offer entitles Le Club AccorHotels Loyalty members, regardless of their status, to benefit from earning 150 bonus points in one of the participating hotels in France for bookings made between Decembre 20th 2015 and December 31st 2016.